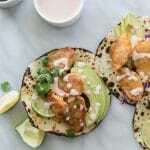 These Beer Battered Crispy Fish Tacos with Chipotle Lime Crema are my favorite simple fish tacos, and the batter is SO crispy and light! 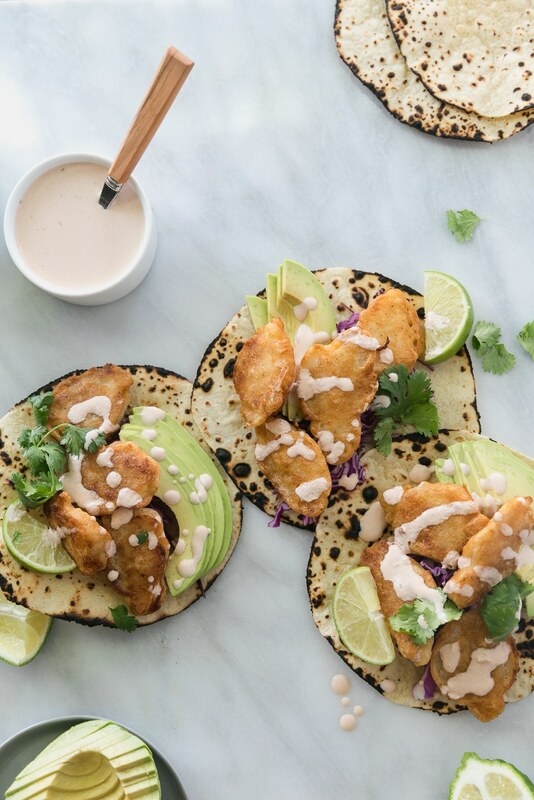 The chipotle lime crema is super easy to make, filled with smoky flavor, and the perfect compliment to these tacos! 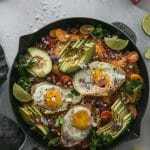 I love serving them with some shredded cabbage, avocado, cilantro, extra lime, and margaritas of course! 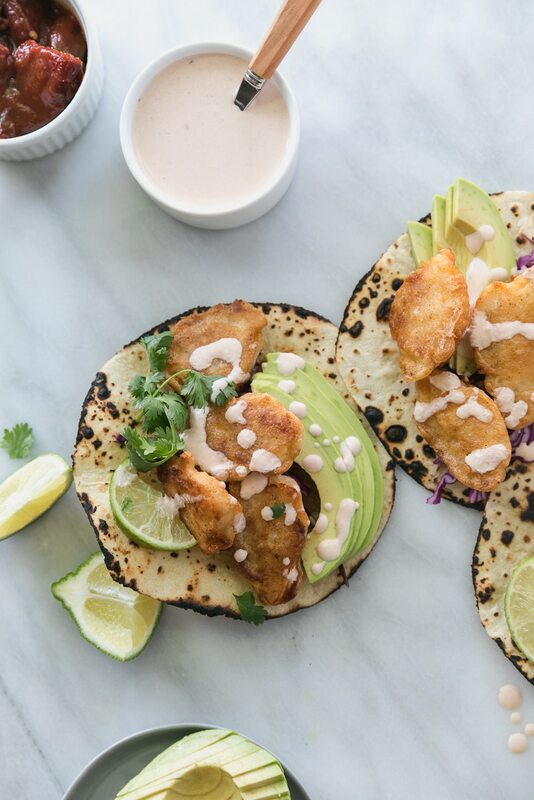 There’s not many things I love more than a good crispy fish taco! 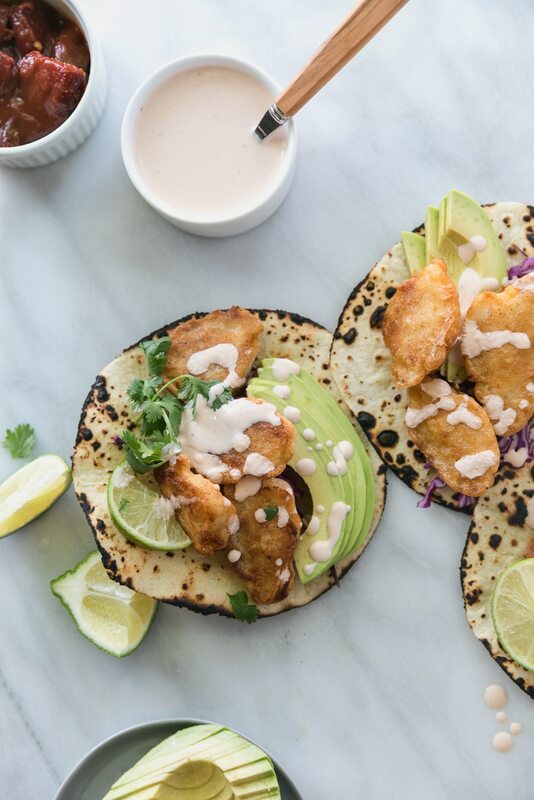 Yes, the grilled ones are good, but to me – nothing beats a crispy, battered, fried fish taco. Nothing. 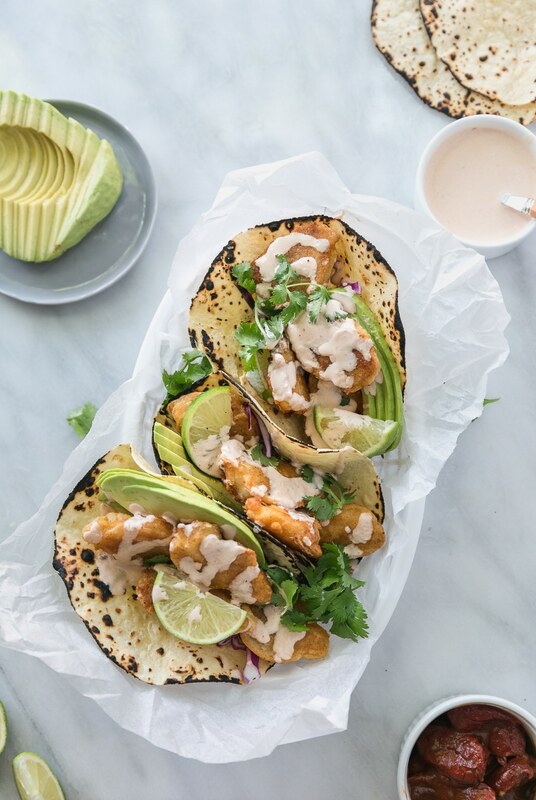 Especially when they’re drizzled with a smoky chipotle crema, avocado slices, cilantro, and extra lime wedges. With margaritas on the side. But really. This crispy fish is just insane. 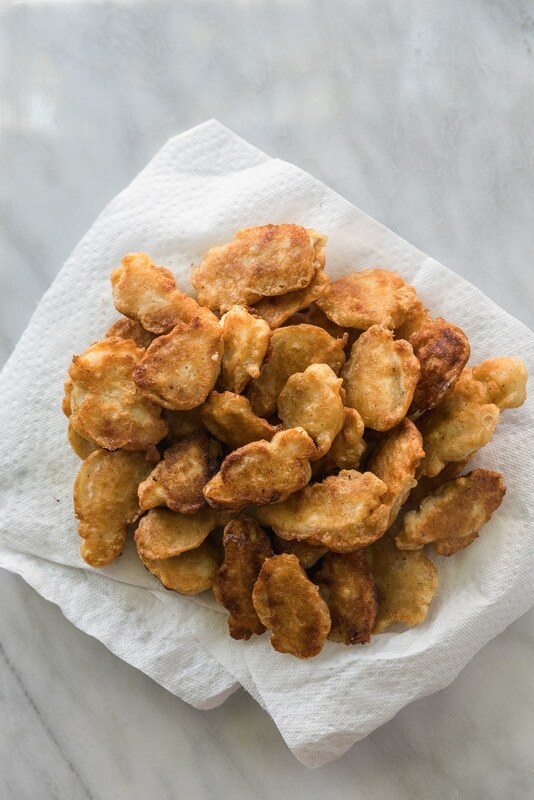 The batter is just light enough, super crispy, and flavorful as heck. And there’s no deep frying! Just a little shallow pan frying, because I know dealing with a big pot of hot oil can be annoying and slightly intimidating. But totally worth it for things like these doughnuts. This crema is something I make pretty frequently when we’re having tacos, nachos, or any kind of Mexican food that needs a little drizzle of something. It’s just sour cream, sauce from a can of chipotle peppers in adobo, lime juice, and salt! That’s it. It’s so good! 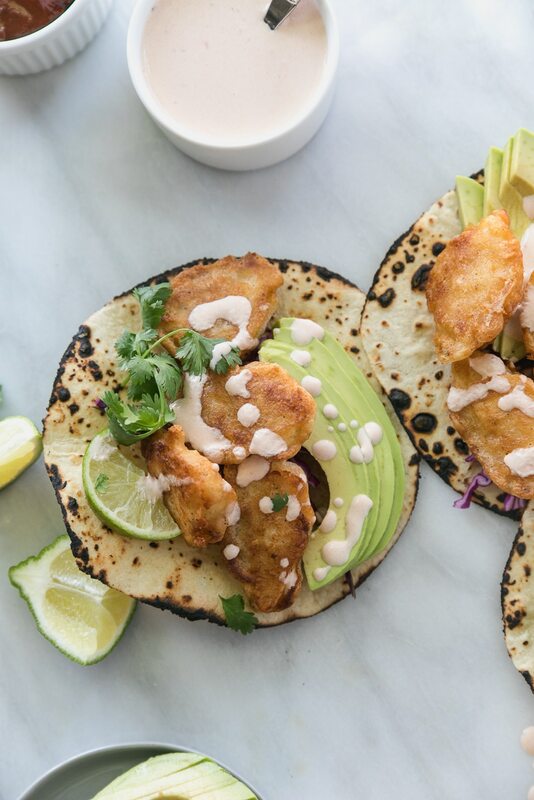 Usually I’d make a slaw or something for tacos, but with these, the fish itself really shines, and I like to just add a little shredded cabbage, avocado, and cilantro. You can get crazy with toppings though. A little cotija or queso fresco would be amazing here too! Or a quick pico de gallo, or some sliced jalapeños if you like extra heat! 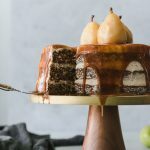 And I can’t forget about my favorite part – that adds another layer of flavor. Charring the tortillas over an open gas flame. 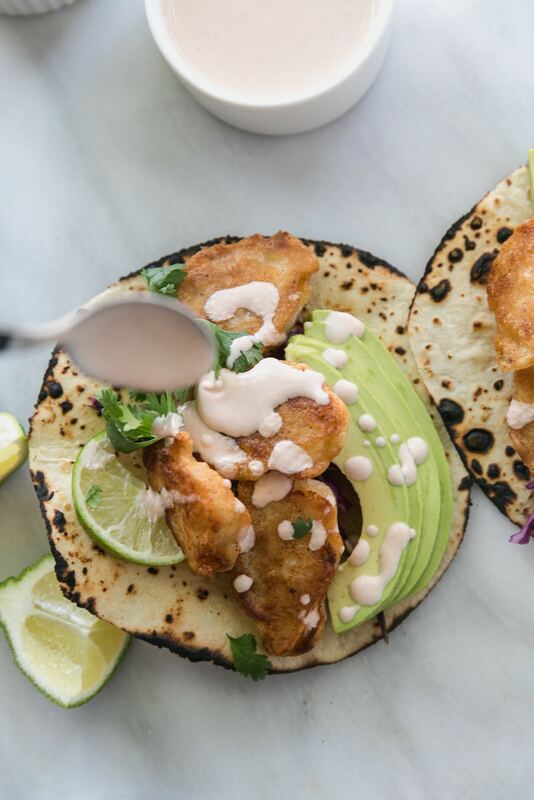 If you don’t have a gas stove, you can skip this step, or grill the tortillas! You’d still get that charred flavor from the grill. It’s amazing and I never make tacos without doing that! Could seriously eat this for every meal for the rest of forever. Make the chipotle lime crema. 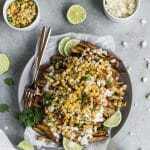 In a medium bowl, whisk together the sour cream, adobo sauce, lime juice, and salt. Season to taste with additional salt if desired. Set aside. Make the dredging mixture and batter. In a bowl or deep plate, combine the flour, salt, pepper, and garlic powder. Whisk to combine. In a separate bowl or deep plate, combine the flour, salt, pepper, cumin, and garlic powder and whisk to combine. Whisk in the beer and hot sauce until smooth. Heat a large nonstick skillet over medium-high heat and add the oil. Dredge the fish pieces in the flour, shake of the excess, and dip in the batter, shaking off the excess as well. Fry for 2 or so minutes per side, or until golden and crispy, depending on the thickness of your fish. Be careful not to overcrowd the pan, to ensure optimal crispiness! Repeat until all fish has been fried. 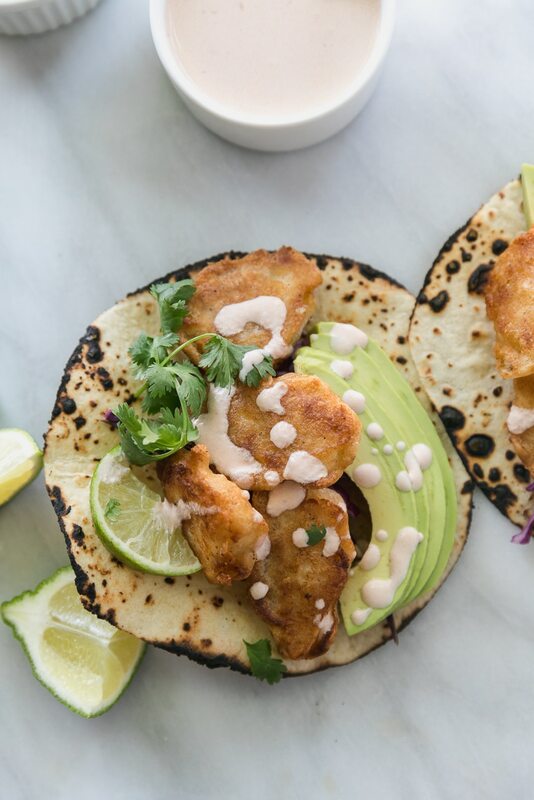 To serve, place a small handful of shredded cabbage in the tortilla, top with a few pieces of fish, avocado, a drizzle of chipotle crema, and a handful of fresh cilantro. 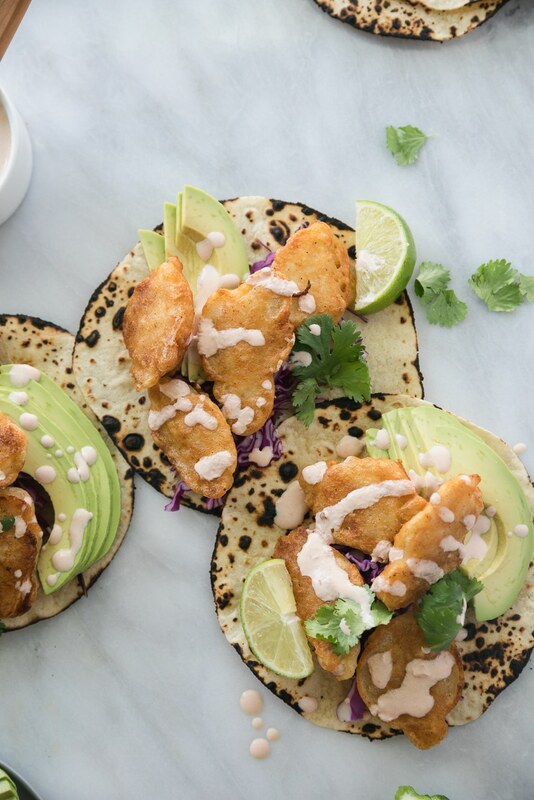 Serve immediately with extra lime wedges!